I immediately started this blog after we moved to the Czech Republic. Back then, I didn’t have any friends and the internet was my only outlet. My initial goal was to connect with family and friends from all over the world. Instead of writing e-mails to each one, blogging provided the perfect medium to connect. Since then, this blog has evolved into a venue for making new friends and connecting to like-minded people while still serving as an outlet for things that I find worth sharing. 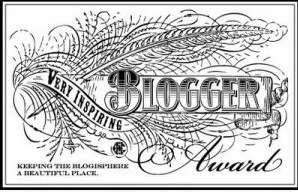 It was through this where I met Marney of Volunteer Fringe, who now nominated me for the Very Inspiring Blogger Award. I am deeply humbled by her nomination. Thank you very much! Please check them out. Once you do, you’ll know why. You’re welcome, Naomi! You very much deserve it. 2 kg’s of pickles!! Wow! Thanks, Jean! Oh, yeah. I bet it’s not just the guitar. I’m encouraged! I just created my WP account and started blogging yesterday. So far, so good! Yay! Welcome to WP Reen. I look forward to reading your blog. Congrats on your award, Grace and thank you so much for being so generous and sharing it with me with such kind words. Although I am new to your blog, I am fascinated by your posts and learning about life abroad. I admire your courage and adventurous spirit. Congratulations to you and thank you for honoring me! I bet you’ve led an interesting life with all those moves ~ many more stories, I presume! You’re welcome, Amy!….I hope so. I am glad to have connected with you also. Thank you for the award and yours is very much deserved. I always look forward to your observations and especially the shots of that cute little one of yours!